Your prescription for a healthier life. Go beyond weight and understand your health at the deepest level possible. 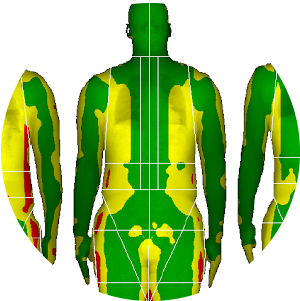 Quickly learn your body fat, lean mass and bone health with 98% accuracy and precision using our clinical-grade DEXA Scan body composition quantification technology and body fat test. Easily discover your cardio fitness level and metabolic health with our VO2 Max Test and Resting Metabolic Rate Test. We use the same tools trusted by medical, health, and fitness professionals as the most accurate and reliable. KNOW with absolute certainty whether your diet and fitness plan is right for your body and goals! Take advantage of our other services such as a Food Sensitivity Test, IV Nutrient Therapy, and Bio-Identical Hormone Therapy. We provide the solutions you need to take control of your exercise, nutrition, happiness, and health. Know the exact location of fat, muscle and bone mass throughout your entire body so you can fine-tune your training and diet for dramatically better results. Learn your cardiovascular fitness level and establish your heart rate training zones to know exactly how many calories you burn during exercise. Know the precise number of calories your body burns at rest to specifically tailor your diet and exercise for losing, gaining or maintaining weight. Get actionable insight and a detailed understanding of which foods you are most sensitive to and easily transform your eating habits. Fend off dehydration caused by common ailments such as fatigue, cold & flu or recover quickly from intensive training and overindulgence. We help both men and women of various ages determine if they have any hormone imbalances and if so, what does the imbalance look like. From there, we offer a Hormone Therapy treatment accordingly. With Live Lean Rx and our partners at AMMG you can explore and become part of a progressive, preventative, and proactive specialty focused on optimum health and fitness not disease. Contact Francesca Guglin to learn more, just click on her name to send an email.